We’d love your help. Let us know what’s wrong with this preview of Everything I Never Learned in School by Darin Colucci. There are some lessons that can only come with age and experience; lessons that make us look back and say, "If I only knew then, what I know now." And while they're essential to providing answers about ourselves, how we approach life, and even our professional aspirations, there's no doubt we wish we'd had those answers long before we got to that point in our lives. In Every There are some lessons that can only come with age and experience; lessons that make us look back and say, "If I only knew then, what I know now." 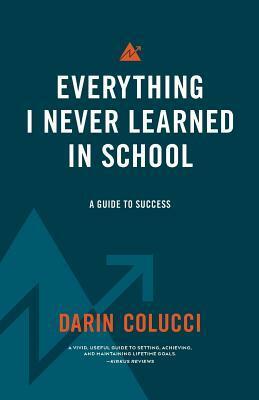 In Everything I Never Learned in School: A Guide to Success , author Darin Colucci aims to help new college graduates, aspiring entrepreneurs, and those with an immense desire to be successful, navigate life's stumbling blocks by sharing a few insights on how to reach your goals and keep happiness along for the ride. A straightforward, practical guide for every high school and college student in America, Everything I Never Learned in School: A Guide to Success is made for the relentless spirit within each of us who yearn to get the most out of life. Building a Strong Financial Future Scaling the Corporate (or Career) Ladder Finding Confidence and Letting Go of Insecurities Achieving Goals that Matter to You How Success and Happiness Should Always Be Intertwined And So Much More Winner of a 2017 Eric Hoffer Award in the category of Self-Help and Semi-finalist for Book of the Year for the Online Book Club, this is a rare, candid look what life can offer us if we only have a few answers before we get there. To ask other readers questions about Everything I Never Learned in School, please sign up. A straightforward and honest guide to getting what you want out of your life. The author Colucci has seen personal success in various fields and gives his candid insights on how he has accomplished his dreams—including becoming a published author. This quick read is a guide to success and personal satisfaction including personal anecdotes, stories about greatly successful people who started with a dream such as Stephen King and Derek Jeter, and a list of "tasks" you can undertake to accomplish su A straightforward and honest guide to getting what you want out of your life. The author Colucci has seen personal success in various fields and gives his candid insights on how he has accomplished his dreams—including becoming a published author. This quick read is a guide to success and personal satisfaction including personal anecdotes, stories about greatly successful people who started with a dream such as Stephen King and Derek Jeter, and a list of "tasks" you can undertake to accomplish success and happiness in your own life. This book makes you rethink a lot of decisions you may have made in life, and inspires you to go after what you want. Has great examples of people who knew what they wanted and went after it...all while becoming greatly successful. Would recommend this book to people who need to be re-motivated with a quick "How-To" guide with tasks for your own success story at the end of each chapter. This is a great and challenging read as Colucci pushes each reader to be the very best version of themselves. I highly recommend!